You know this one. It’s a young adult fiction trilogy, set in a dystopian post-apocalyptic future society. What remains of America’s population is living under a bizarre, brutal, fantastically unequal social system, which turns its young people into symbols for the future, and simultaneously fears their strength, and their sense of fairness. In this setting, a beautiful young couple, set apart by their special skills and hated by the old dictators, must fight the system, become leaders of a rebellion and ultimately overthrow the corrupt hegemony. It’s not The Hunger Games this time, though. With the release of Neil Burger’s feature adaptation of Divergent, Veronica Roth’s franchise is stepping in to claim the runner-up position in this particular arena. It’s so easy to understand the appeal of this genre, especially since the target audience is teenagers. It offers classic wish fulfilment fantasies. Its role models have it hard. They’re admired and persecuted in equal measure by their elders. Of course, you want to be them, because they’re beautiful, strong and resilient. They’re in love, and it’s complicated and angsty but it’s pure and real because it’s never happened to them before. Above all, they’re special. They’re unique. They’re not like the rest of the herd. You (that is, in the presumption you belong to the ideal audience) understand them and identify with them, and isn’t that because you’re special, too? The marketing behind Divergent uses this appeal explicitly, asking “Are you Divergent?” and offering choices and tests to mimic those in the story. And of course you’re Divergent. Unfortunately, that’s just because everybody is. Unfortunately, the system these people are meant to be conforming to is pretty stupid. There was a catastrophic war some time in the past, and afterwards, in a partially destroyed Chicago, five governing “factions” emerged. The system is based on the principle that human nature causes all problems and leads ultimately to war; therefore, to preserve peace, humans must suppress their natural inclinations. Each faction is based on a positive human quality that its members are supposed to share, and each is charged with a different aspect of running the city. So, the Dauntless faction are all brave, and they act as the police force. The Erudite faction are all clever, so they teach and research. The Abnegation faction, into which our heroine Tris (Shailene Woodley) is born, are selfless and live to serve others, so they are entrusted with government. Roth’s novel makes the rationale behind this clearer – each faction’s choice of guiding quality is based on rejecting a cause of conflict – cowardice, ignorance, selfishness – which makes it a little more understandable, but the entire system still makes little sense. For one thing, young people are expected to choose a faction at the age of 16, They’re given an aptitude test, involving their response to drug-induced hallucinations, and most are judged to be suited to their parents’ faction. This is where Tris’ story begins. Before she takes it, the test is depicted as a vital, life-defining thing, so much so that those that it can’t categorise are seen as damaging the fabric of society – but the kids don’t actually have to pay any attention to its result when deciding their future. They’re told that they must know themselves in order to make this decision; there will be no chance to change in future. It’s OK to be judged as Abnegation, selfless and self-sacrificing, and choose to join Dauntless, the faction for brave and foolhardy and decidedly selfish people, but not OK to be tested as both selfless and courageous, no matter that these aren’t exactly contradictory qualities. It’s expected that any child will be brave enough to abandon their families forever at 16 if their choice is different to their parents’, but bravery is the preserve of the Dauntless faction only. 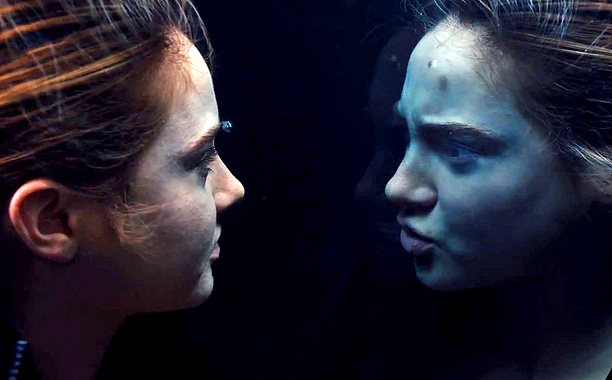 Joining selfless Abnegation could be a decidedly selfish act. And so on. The idea that everyone can be able to choose a life path at 16 is as daft as the idea that a person can live by one governing principle alone, but the fantasy of choice, of knowing yourself at such a young age. is designed to be hugely appealing to teenagers. As the whole plot of book and film has been tortured into the shape demanded by this premise, the only way to get any enjoyment out of them is to accept it as it’s given. Otherwise, you’ll spend the whole thing saying, “But this is just stupid” over and over again. Anyway, the rest of the film – the beautiful young people, the training and shooting and fighting – is all perfectly OK for what it is, but what it is doesn’t add up to very much. A great deal of this (very, very long) film is spent on exploring the life of hard training overseen by a cute boy called Four (Theo James), co-ed dormitories and war games after dark that Tris signs up for when she chooses to be Dauntless. It’s very faithful to the novel, (as young audiences demand) designed to appeal to aspirational teenagers, who are presumed to be longing for a quasi-independent, collegiate life but who still need the safety of rules and educational institutions. There’s bullying and bonding, and the same mean girls and boys you’ll find in any high school drama, but there’s also cool knife-throwing and forced bare-knuckle fighting. But the real purpose behind it all is rarely alluded to, and the interesting mysteries of the plot are only glimpsed. Just what is it on the other side of the fence that’s so terrifying? What caused the war? Is there more to the faction system than we’ve been told? A little more attention to these questions could have gone a long way towards raising the stakes beyond who will graduate bottom of the class? It’s only the first in the trilogy, and perhaps there’s something more substantial yet to emerge, but evidently, Divergent is the sort of thing that falls apart the minute you start to examine it. And maybe it’s uncharitable to do so, but sadly, the experience of watching (and reading) it is not compelling enough to allow total suspension of disbelief, and all the action and romance it can throw at us can’t quite banish that creeping feeling of “But this is stupid.” It’s not that it’s exactly alone in this. The Hunger Games would have us believe that, when its dictatorship puts beautiful young people in the arena to slaughter each other, and inadvertently makes martyrs and symbols of freedom out of them, instead of quietly getting rid of them or discrediting them or whatever, it decides the best way to handle the problem is to do it all over again. But The Hunger Games also has distractions aplenty – great frocks, an all-star cast, and most importantly, a brilliantly confident and clear brand of heroism. Katniss, Peeta and Gale are underdogs in every way. They belong to the most socially and economically deprived of all the twelve districts. They have grown up living on rats and grass. Their enemies are all richer and more privileged than they are. They’re fighting from an unimpeachable position for fantasy winners, having no advantages whatsoever. Tris and Four, on the other hand, are part of the entitled upper classes. Because the film practically ignores the questions of what led to Chicago being this way in the first place, and more importantly what threats to its peace lurk outside its fences, the conflict in Divergent is reduced to little more than sophisticated political infighting among the privileged few who’ve succeeded in this brittle system and stayed members of a faction. When it’s the rich lawyers and the rich civil servants bickering over which of them gets to be in charge, it’s hard to care that much about who’s going to win. Oh, you’ve put me *right* off!